1. 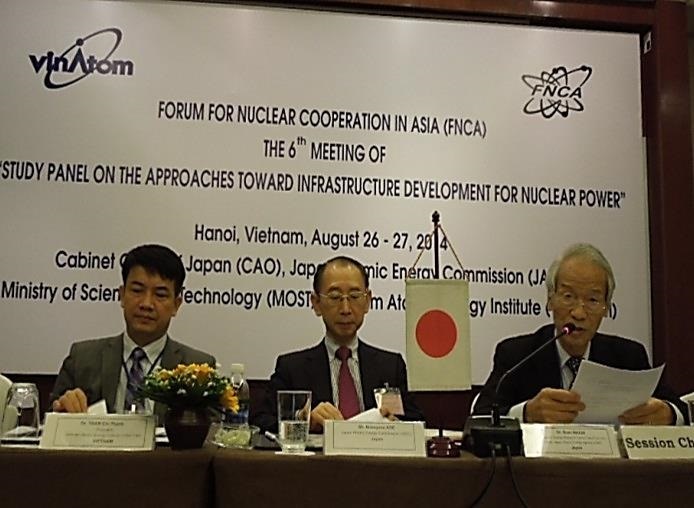 The Forum for Nuclear Cooperation in Asia's (FNCA) 2nd panel meeting on the "Role of Nuclear Energy for Sustainable Development in Asia" opened with an Opening Address from Prof. Shunsuke Kondo, Chairman of the Japan Atomic Energy Commission. The meeting was attended by 20 participants from 7 FNCA member status. 2. Session 1 was moderated by Dr. Sueo Machi, Commissioner of the Japan Atomic Energy Commission, who briefed on the outcome of the 6th Ministerial-Level Meeting, and explained the overall program for the panel . 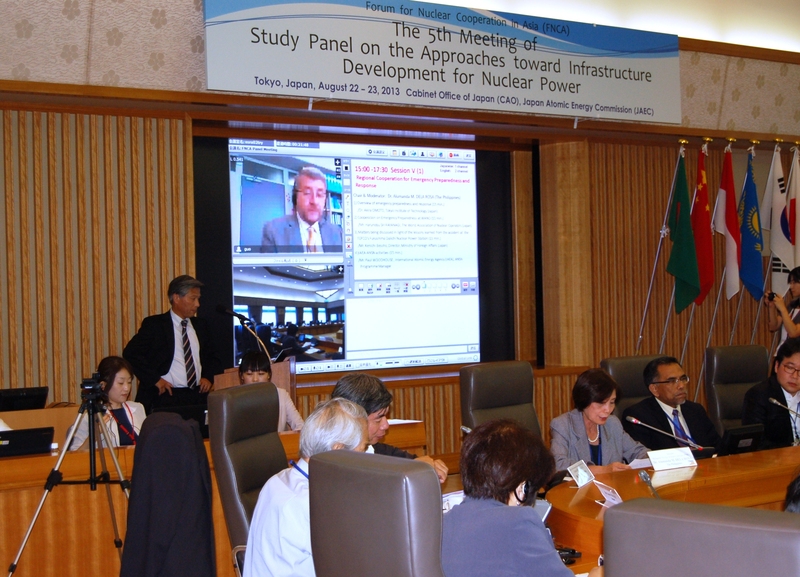 Dr. Machi then reported the recent global trend in the role of nuclear energy in the context of growing energy demands in Asia and the intensifying necessity for the control of global warming. 3. In the presentation of country reports in Session 2, representatives from participating countries reported their nations' energy demand outlook, the role of nuclear energy, and common issues in introducing nuclear power generation. The session was moderated by Mr. Dol Malek Bin Md. Sap of Malaysia in the first half, and Dr. Arnold Yahanes Soetrisnanto of Indonesia in the second half. Rapid social and economic development will bring an accelerated increase in energy demand in the region of FNCA countries. With limited fossil fuel reserves, the FNCA region is projected to increase its dependency on the importation of oil, natural gas and other resources. There is a concern on the impact of possible drastic increase in fossil fuel price. The global environment is deteriorating due to global warming, caused by carbon dioxide released from using fossil fuels, and environmental pollution with sulfur dioxides and nitrogen oxides released from coal combustion. Effective future options for ensuring stable energy supply and preventing the further acceleration of global warming include promoting energy conservation, improving the efficiency of fossil energy use and the approach of optimum energy combination, i.e. making maximum use of nuclear energy or alternative energies, such as solar and wind power, taking advantage of their respective characteristics. In order to achieve sustainable development of FNCA countries, facing rapidly growing energy demand, it is necessary to ensure stable energy supplies and while concern about global warming. Since nuclear power generation does not release carbon dioxide in its power production process, nuclear energy is one of the practical energy sources to contribute to mitigating global warming. It is important to have discussions between countries in Asia and in Europe, and between experts of environment and nuclear energy to promote possible inclusion of nuclear power to CDM. Nuclear energy can contribute to stable energy supplies. Some delegate showed interest to in a suggestion to appeal COP to review nuclear power to be included in CDM based on the long experience of nuclear power plant providing clean energy by safe manner. Mr. Wataru Mizumachi, Director General, Planning and Coordination Division, Japan Nuclear Energy Safety Organization, presented a lead-off speech, introducing relevant legal systems in Japan and explaining the safety and mechanism of nuclear power generation. He also mentioned that there is no technology with absolute safety, and nuclear power plants with proven technology have solid safety features. It was noted that the public is still concerned about nuclear safety, therefore the communication with the public on safety feature with the support of qualified international organizations is desirable. Assurance of safety with economical feasibility has been realized. 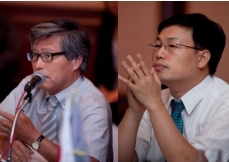 Chinese representative Prof. Wu Chunxi, Vice President, China Institute of Nuclear Information and Economics gave a lead-off speech, describing the current status and future plans in human resource and technology development in China. Delegates confirmed the importance of securing / fostering human resources from a long-term perspective, particularly for the countries introducing nuclear power generation. ANTEP activities, which was reported by last ministerial meeting, are expected to contribute human resource development. Mr. Koji Nagano, Senior Researcher, Socio-Economic Research Center, Central Research Institute of the Electric Power Industry, made a lead-off speech, introducing economics of nuclear power depending on the time frame setting. It was understood that generally nuclear power generation is economically competitive with other energy sources in the long term, despite of the large initial investments. Economic comparison between nuclear power and thermal power should be country specific, due to cost differences in fossil fuels. 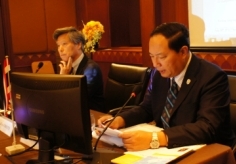 Dr. Myung Jae Song, Director General, KHNP, presented a lead-off speech, introducing the process of building a national consensus in determining the site for a mid- and low-level waste disposal facility . It was understood that public understanding and trust is essential for public acceptance of nuclear power generation in smoothly implementing activities and that it is importance of ensuring transparency in activities promoting nuclear power. Kaoru Naito, Senior Executive Director, Nuclear Material Control Center, made a lead-off speech, explaining the importance of nuclear safeguards, physical protection of nuclear material and export control. It was understood that ensuring nuclear non-proliferation is the fundamental issue for introducing nuclear power and international cooperation associated with nuclear energy. c) It was noted that concluding and enforcing the IAEA's comprehensive safeguards agreement is a major prerequisite, for non nuclear weapon state party to NPT and its Additional Protocol is the effective means of strengthening it. 7. In Session 6, the participants agreed that the panel is useful and fruitful forum to share experiences and information among countries which have already introduced nuclear power, the countries which have plan of nuclear power and countries which have no plan for. Delegates emphasized interests in human resource development, public acceptance, economic feasibility and financing analysis for nuclear power. Delegates agreed that the draft of final report would be submitted to the 3 rd panel meeting in cooperation with the Panel members. (3)Advantage and Disadvantage of Non-Fossil Energy.